All of the books and programs listed below are available ONLY by digital delivery or online access. You will receive INSTANT ACCESS to these programs as soon as you send your order. All of these products are delivered via digital delivery. This means NO PRINTED COPY WILL BE SENT! Massively muscled Mr. Universe reveals his highly unusual bodybuilding secrets for building maximum muscle... in minimum time. 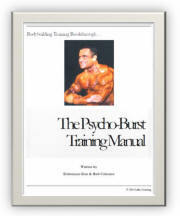 Includes manual, audio interview & online video. A completely different approach to bodybuilding that can build your physique to its maximum genetic potential.